A stocking cap is no longer the only option in girls' winter hats. Today, there are as many different fashions and styles as there are girls with different tastes in clothing. If your child is still young, you may be able to direct her to wear a hat that is functional and will simply keep her warm. However, if your daughter is a bit older, she likely has a strong opinion about what she will and won't wear. The challenge with older girls is to find a hat that matches her preferences while still keeping her warm. The knit beanie or skullcap has been around for many years and is probably one of the most popular hat choices for girls. Not only do beanies come in a wide variety of colors and patterns, but you can even find beanies with poms on top for decoration. Today's beanies also come in materials like fleece. The Peruvian winter hat is another popular favorite for girls. The Peruvian resembles a beanie, but has earflaps that come down on the sides and protect sensitive ears from the cold. The earflaps typically taper down into narrow strips with poms on the end. Most Peruvian style hats for girls do not tie under the chin, although a few do. For a really unique, warm and soft had, try one made from alpaca fur. Wool hats are more typically worn by boys, but in recent years have become available in colors girls love, such as lilac, pink and baby blue. Wool keeps out those cold, damp winter days and wears well, meaning it can be passed down from one child to the next. Most wool hats come with wide earflaps. The overall look is different than the Peruvian hat, however. The front of a wool hat is typically turned up to reveal a faux fur interior. The earflaps do not taper down or have poms. Trapper hats are perfect for the middle of winter. The trapper has a top that looks like a cap, but has covering that comes down and protects the back of the neck and ears. The inside is typically lined with thick faux fur or real fur. In the past, these hats were mainly made of black leather, but today are made of a variety of materials, including moisture resistant fabrics. You'll find designs from plaid to hot pink. How much time does your child spend outdoors? A child who plays outside for several hours at a time will need warmer materials. Does your child like to play in the snow? You may want to choose moisture resistant materials. What is your daughter's favorite color? 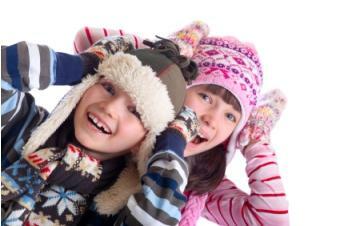 The warmest hat isn't going to do any good if your child refuses to wear it because she hates the color. Will the hat be passed down to younger siblings? You may want to spend a little more to get a quality hat that will withstand several seasons. Ultimately, the perfect girls' winter hat is the one that your daughter loves and will want to wear.